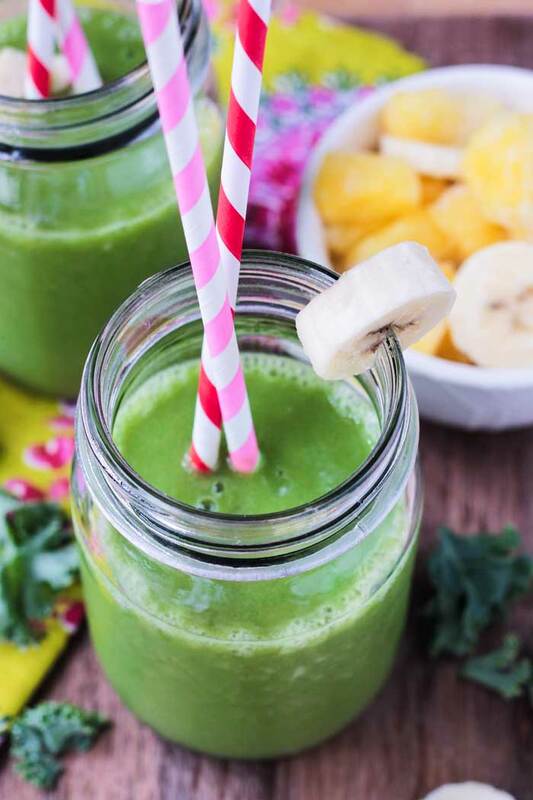 Tropical Green Smoothie – a delicious, easy way to consume those healthy greens! We all know that leafy greens are super healthy for us. I love starting my day with a green smoothie. It really sets the day off on the right foot. Leafy greens, specifically kale, contain vitamins: K, A, C, E and several B’s, plus calcium, fiber, potassium, iron, magnesium, folate, and even protein and healthy omega-3 fats! Greens are not to be ignored! But a lot of you out there don’t like to eat them raw and don’t really know how to cook them. No matter – let’s drink those greens instead! 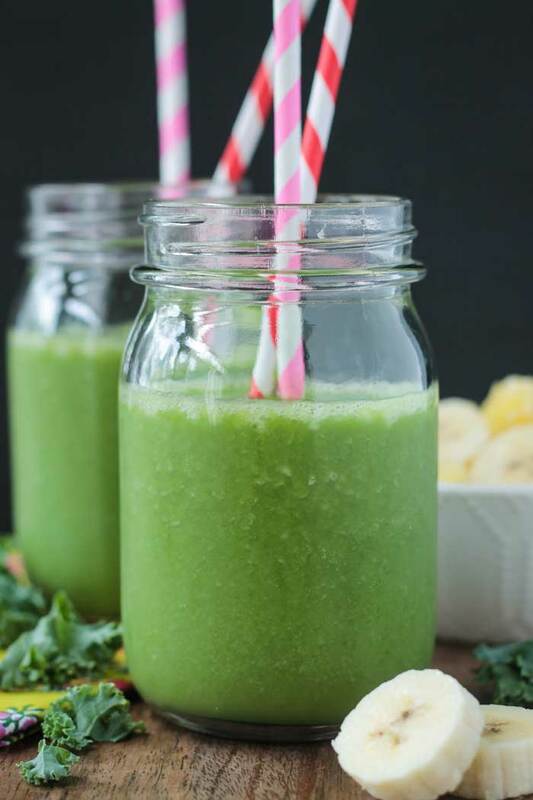 In this dairy free Tropical Green Smoothie, you won’t taste fibrous bitter greens, but you will reap the health benefits, while sipping on this sweet tropical deliciousness! When you start the day doing something healthy, you are likely to continue that pattern throughout the rest of your day. Not only is this dairy free green smoothie healthy, but it’s super refreshing too. 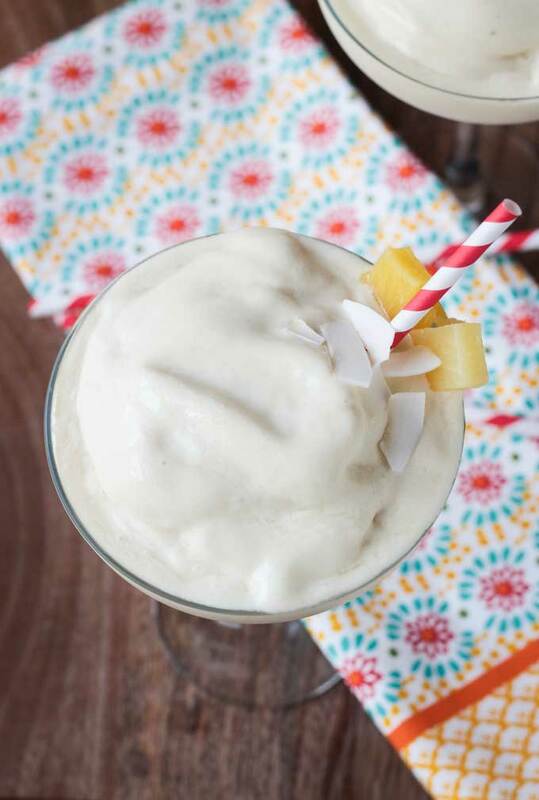 I brought the flavor of the tropics to this creamy beverage with pineapple, banana and coconut. Feeling an afternoon slump come on? 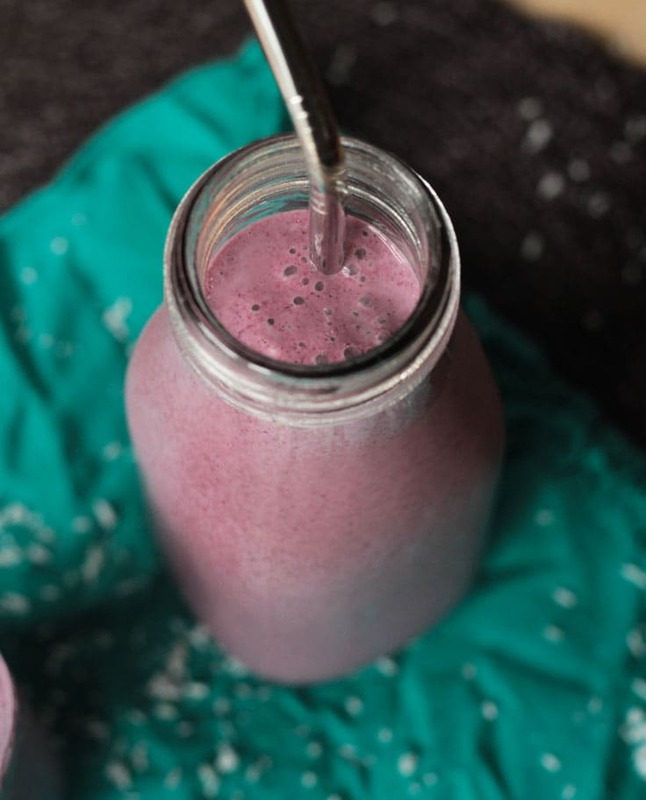 Grab your blender and brighten up your day with this vibrant vegan drink. Full of electrolytes and immune boosters, it’s the perfect pick me up! Think you don’t like greens? 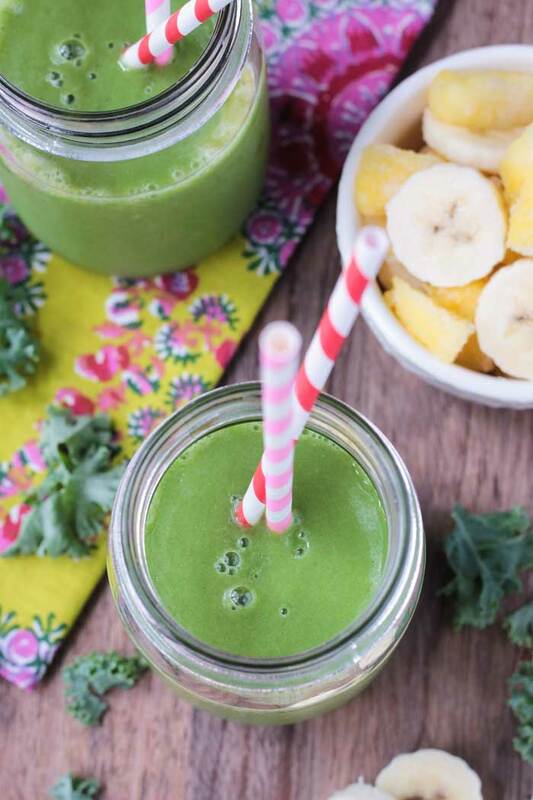 I can’t wait for you to try this Tropical Green Smoothie! I love hearing from you guys, so please leave me a comment and star rating below after you try it! You can also find me on social media. Be sure to tag @veggie_inspired and #veggieinspired so I don’t miss it. Tropical Green Smoothie - a quick and easy way to get your greens! 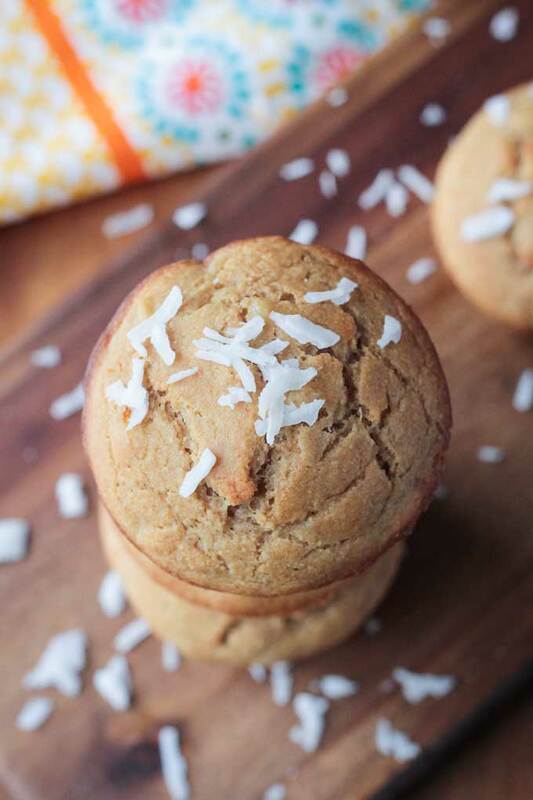 Wonderfully refreshing and perfectly sweet with no added sweeteners! Add all ingredients to a high speed blender and puree until smooth. If smoothie is too thick, add a splash more coconut water or almond milk. I am TOTALLY with you! I drink a green smoothie every single morning and I love it! Even when we go on vacation (if I can’t bring my Vitamix along), I find a nearby smoothie shop that I can hit up for breakfast! This smoothie sounds so refreshing too! Makes me want to go relax on the beach and sip this healthy drink! OMG, I have never thought to take my Vitamix on vacation, but what a genius idea!! I know people who take their Instant Pot too – again, genius. I am totally doing both of those next time! Thanks, Laura!! Let’s go beaching! I’ve never been able to stomach coconut water (tried all the “best” ones!) but haven’t tried it in a smoothie like this. May need to give it a go! Alisa, I don’t like it plain at all! But you don’t taste it in this smoothie…just the fruits! Okay, very good to know!